With the increasing demand for the mobile app development for their businesses start up and enterprises heading towards a new way of digitizing their business. Mobile app developing companies are searching for the best mobile application development skills to get their projects done speedily and best possible way. So the demand for the mobile developers are more than ever in 2019. With the advent of the latest technologies such as AR/VR, Blockchain, AI, IoT, and more, the need for skilled developers are growing at rapid speed. This article is for those who are searching for to becoming the best mobile app developers and want to work in a top development company for their bright future. Apart from the above-mentioned factors, some of the noteworthy ones are mentioned below. Increasing competition - the entrepreneur has a lot of mobile app development competitors. Abundance of apps - The app store is flooded with all kinds of apps and it is difficult to stand out among the traditional apps. It is a staple to have the technical background before you enter in app development. However there is no specific need for the qualification but you need to have a bachelor or diploma in computer science, or a specific course will do the work for you. It is not mandatory to have this degree to become a proficient developer. There are certain online courses and documents that can be enough to become the best developer. When it comes to technical skill here we have given some of the best development skill that will help you in mobile app development. Two leading mobile app development platform Android and iOS should be on your top of the list to learn. Apart from that being familiar with API development platforms, cross-platform app development platforms, and responsive design for mobile apps is an added advantage. For web development, there are numerous languages like PHP, Ruby on rails, .Net and many more. You can select the appropriate language for your scope of work and your inclination toward a particular platform. Apart from expertise in front end language, you need to have skills in backend also. Expertise in computing such as database management, memory allocation, hardware integration and security, and so on. Building a mobile app is not just about coding. 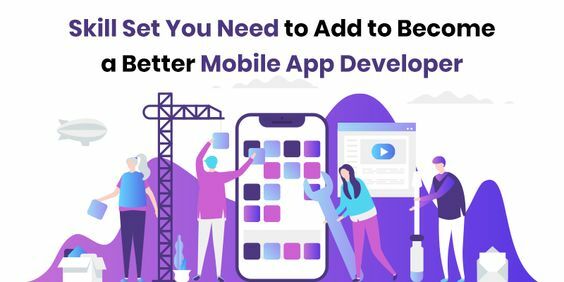 You need to invest your efforts and time in various other phases of mobile app development, including testing, designing, testing, and marketing. Having total knowledge about these phases will make it easier for you to develop a perfect app. Additional knowledge of business and understanding of the business world will help you to build a mobile application that sells and gain higher app visibility to earn higher app revenue. To add the value to your skills it is best to be Superior in knowing the disruptive technologies as well. Considering the propensity of more and more retailers and other businesses of incorporating Augmented reality into their businesses, the need for developers who have a great knowledge in the AR is very high. Virtual reality goes one step ahead of the AR and has higher application areas as Augmented reality. Knowledge of virtual reality will give developers great chance to excel in mobile app development. As time passes, the AI (Artificial intelligence)is becoming more and more mature. From business processes to daily activities, AI, with machine learning is ready to give comprehensive solutions, with advanced data analytics. Hence, in coming days we are going to experience a lot of mobile app development services based on ML (Machine learning and AI). Keeping in the mind more and more smarter devices are being used, developers should be aware of the IoT(Internet of Things). As more entrepreneurs will start jumping on IoT bandwagon in 2019 onward, more companies will integrate IoT based mobile apps. And to meet these high requirements, a high number of mobile developers who understand IoT will require. Apart from the aforementioned technical skills, there are innumerable skills that you should add to your resume. These skills will help you unique from the crowd. In addition to the qualification and mobile application development skills mentioned above, work experience on reputed mobile app development company helps you understand the inside out of the mobile industry. Along with these skills, developers need to stay in touch with the market trends of different industry verticals which can help them solve the problems and simplify the process.